The Mandala (literally meaning a circle) is a Tantric meditation device. It is a visual aid for concentration and introvertive meditation leading to the attainment of insights and to activation of forces culminating in "Siddhi" supernatural forces. The Mandala is the graphic representation of this process. It is not only theoretical but practical as an operational scheme involving a clear plan for practical realization of the process within oneself. It thus becomes an instrument (Yantra). There are many types and varieties of mandalas depending on the nature of the central deity. The most classic pattern of mandalas are of the Dhyani Buddha. This pattern appears in the oldest tantrics. 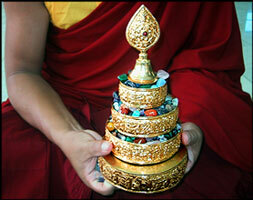 The mandala represents 'Palace of Purity' a magic sphere cleansed of spiritual obstacles and impurities. The square of the 'sacred palace' proper is enclosed in multiple circles of flame, vajra, eight cemeteries (appears only in wrathful deities) lotus, then the inner square to reach of the deity of the Mandala.